SKU: 4012927344507 Categories: Trading Card Games, Yu-Gi-Oh! Judgment of the Light just got a powerful enhancement, introducing the Judgment of the Light: Deluxe Edition! Each Judgment of the Light: Deluxe Edition comes with NINE Judgment of the Light Booster Packs where Synchro Monsters make a BIG comeback. That’s not all. 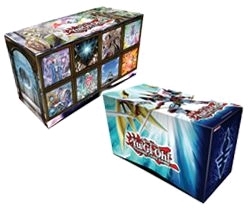 Included are 2 FOIL versions of common cards, 1 pack of 50 sleeves, and best of all 1 of 2 FOIL version preview cards from the next Yu-Gi-Oh! TRANDING CARD GAME Booster Shadow Specters!! !